The polar nature of the C=O (due to the electronegativity difference of the atoms) means dipole-dipole interactions will occur. Though C=O can not hydrogen-bond to each other, the C=O can accept hydrogen bonds from hydrogen bond donors (e.g. water, alcohols). The carbonyl group consists of an O atom bonded to a C atom via a double bond, C=O, via an sp2 hybridisation model similar to that of ethene, H2C=CH2 (review ?) 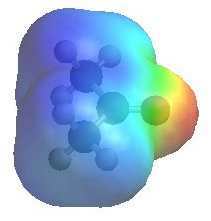 with bond angles close to 120o. O is connected to the carbonyl C via a σ and a π bond. The C=O and the two other atoms attached to the C are co-planar. 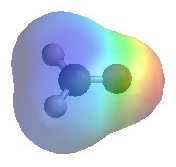 This implies that the two lone pairs on O are in sp2 hybrid orbitals. The more red an area is, the higher the electron density and the more blue an area is, the lower the electron density. The O atom in the C=O is a region of high electron density (red) due to the lone pairs. There is low electron density (blue) on the C atom of the C=O group. The image shows the electrostatic potential for propanone (acetone). IMPORTANT : The reactivity of aldehydes and ketones can be easily rationalised by considering the important resonance contributor which has a +ve C and -ve O. Note that this matches the ideas shown in the electrostatic potential diagrams shown above. Methanal is a unique aldehyde in the sense that it is the only aldehyde that has 2 H atoms attached to the carbonyl group and ALL other aldehydes have only 1 H atom attached to the carbonyl group. The electronic effect of the substituent. Alkyl groups are weakly electron donating so they make the C in the carbonyl less electrophilic. Therefore methanal is more reaactive than other aldehydes (extra R group) and ketones are less reactive than aldehydes for the same reason. The size of the alkyl substitutents attached to the C=O. Larger groups will sterically hinder the approach of the Nu and reduce the relative reactivity. The images below show spacing filling models so that you can investigate the accessiblity to the electrophilic C across a series of aldehydes and ketones where the size of the alkyl groups attached to the carbonyl C change from -H to t-butyl (-C(CH3)3 ).